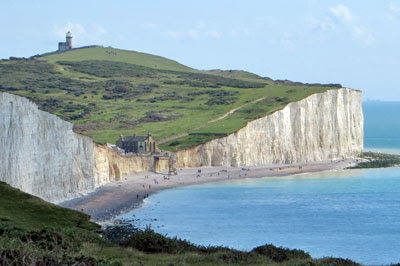 Every two years I go on the best walk in southeast England - over the Seven Sisters to Beachy Head. The ups and downs aren't for the faint-hearted, but the views are spectacular. 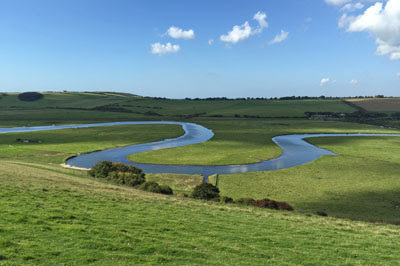 Along the way I pass my very favourite meander, on the River Cuckmere. I'm sad to say the cult of the selfie is rife even immediately above a 500 foot sheer drop. 1) Eastbourne Pier is open and busy, but not entirely recovered from last year's fire. 2) Eastbourne Bandstand's summer series of tribute concerts closed this week with an Abba fireworks finale. 3) Ice creams are £1 cheaper at the Beachy Head Kiosk than at Belle Tout lighthouse. 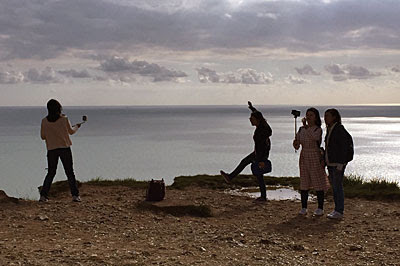 4) Beachy Head is an increasingly popular spot for drone-flying. 5) Yesterday the pub atop Beachy Head couldn't do food within an hour, and claimed to have run out of beer. 6) Cliff collapse at Birling Gap has led to three metres of retreat since my last visit. 7) Alas, the National Trust's new ice cream parlour at Birling Gap lasted less than a year. 8) The Seven Sisters comprise eight chalky humps, one of which is notably less precipitous than the others. 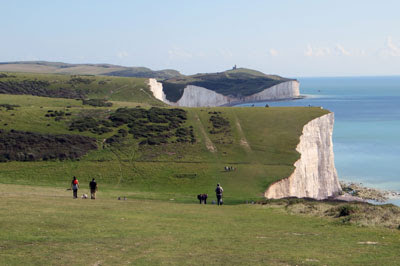 9) Particularly fit people go running over the Seven Sisters - most of us have enough of a challenge walking. 10) The cost of a ticket on the very-regular number 12 bus from Exceat to Eastbourne is currently £2.40.